On Monday August 1st, regional leaders of San Miguel Ixtahucán hand-delivered the Peoples International Health Tribunal verdict to the Guatemalan government, the Canadian embassy and Goldcorp’s Guatemalan office. The verdict clearly found Goldcorp guilty for environmental harms, health problems and illnesses and human rights violations. While both government representatives accepted the document, Goldcorp’s offices would not accept a copy of the verdict, refusing to engage with mining-affected community leaders. In Vancouver, Canada, a group of Canadian citizens, similarly concerned by Goldcorp’s misconduct, were able to share the verdict with administrative staff at Goldcorp headquarters although barring their entry, further dialogue, and refusing to sign a confirmation that the document was received. These actions were a follow up from the 2-day Peoples International Health Tribunal that showcased community testimonies (available in Spanish here) as well as scientific accounts of the impact of Goldcorp mining on communities in Mexico, Honduras and Guatemala. Further, they were part of a larger Continental day of action demanding justice and an end to impunity in the mining sector. With more than 10 cities across Canada, 12 cities in Colombia and simultaneous actions in other countries including Argentina, Chile, El Salvador, the Dominican Republic, and the United States, the movement urged their governments to: (1) divest from mining companies known for human rights violations and environmental infringements and put an end to corporate mining complicity (2) respect free prior and informed consent of indigenous and campesino communities and community consent processes, such as community referendums that have rejected mining projects and (3) further regulation to hold corporations accountable for their misconduct. More pictures and footage coming soon! Wednesday, August 1st is a‘Continental Day of Action Against Canadian Mega Resource Extraction.’ In Vancouver, a protest action will take place in front of Goldcorp’s corporate headquarters, starting at 4:30p.m. at 666 Burrard Street. 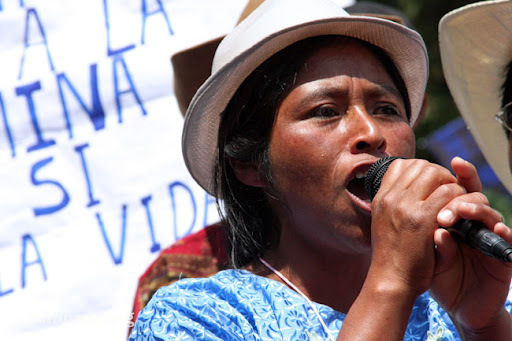 Goldcorp’s record in Central America and Mexico was recently put before a People’s Tribunal in Guatemala. Here, two of the judges explain why Goldcorp was found guilty. For two days in mid-July, a panel of 12 judges from different countries with expertise in health, the environment and human rights, came together to hear testimonies and complaints from people affected by Goldcorp’s mining operations in Carrizalillo, Mexico; Valle de Siria, Honduras; and in San Miguel Ixtahuacán and Sipacapa, San Marcos, Guatemala. We were honoured to be two Canadians among this international panel of judges, in particular because of the heavy responsibility Canadian mining companies and Canadian government policies bear for the impacts of mining on the health of people in that region (as well as elsewhere in the world). Jointly organized by the Coalition for the Defense of San Miguel Ixtahuacán, the Toronto-based grassroots organization Mining Injustice Solidarity Network and M4 (the MesoAmerican Movement against extractive Mining Model), this Tribunal focused on health effects suffered by communities affected by Goldcorp, a Canadian mining company based in Vancouver, Canada and registered as a publicly-traded company on the Toronto Stock Exchange. Canada is the centre for international mining corporations due to the lax regulation which extractive industries enjoy in this country for their activities in the rest of the world, with respect to health, human rights, environmental protection and labour rights. In addition, the Canadian government, through its Department of Foreign Affairs and International Trade and CIDA, intervenes directly in the affairs of other governments in order to create a legal and political context which is favourable for the operation of Canadian mining companies. For the last 15 years, Goldcorp has been involved in mining exploitation in different Latin American and Central American countries, extracting gold by dangerous methods which violate human rights, promoting false development projects through the manipulation of local communities, damaging the overall health and the local environment of affected communities. According to the OCMAL (Latin American Mining Conflict Observatory OCMAL), this extractive mining model has created some 165 conflicts in Latin America, of which 35 are in Mesoamerica (Mexico and Central America). While we were able to draw on a distinguished panel of expert witnesses, the most important testimony we heard came from members of the affected communities in Mexico, Guatemala and Honduras. Women and men whose voices are usually excluded from the international debates which have direct impacts on their daily lives were able to detail to us the many different ways they and their communities have suffered from Goldcorp’s mining activities. We heard in detail about contamination and loss of water sources, irreversible environmental devastation, toxic dust containing heavy metals and potentially carcinogenic elements that bioaccumulate in organisms, destruction of crops and soil, illness and death of wild and domestic animals. Former Goldcorp employees told us that mine workers suffer from frequent leaks, toxic chemical explosions, and workplace injuries (some of them lethal) due to a lack of safety equipment and lax procedures. Notable signs of community trauma include a huge increase in bars, alcoholism, drug addition, and gender violence, the appearance of prostitution, venereal diseases and of HIV/AIDS. In addition to the physical health problems, these communities have been profoundly affected in their spiritual and emotional health. People suffer from depression and loss because of the climate of fear, impotence and insecurity. As we one witness told us: “It is a sad life that I am living … they go around destroying life.” It is clear that the advent of mining has traumatized both people and communities. The environmental, social and health effects of extractive mining operations do not end when the mines close, but rather last for generations. The medical emergency caused by mining is current and ongoing. In all cases, mining operations were imposed on communities without their prior consent, and have created divisions and conflicts within communities and even within families. In all cases there has been an increase in tension, mistrust and violence at the community level. We heard about polarization and fragmentation of community life, pitting neighbour against neighbour, and a feeling of being betrayed by government officials who defend the interests of the company over the individual and collective human rights of the communities. Despite all the intimidation and violence they have experienced, these brave women and men took the opportunity to speak out in defence of their lands, their communities, their health and their cultures by giving a voice to those who are too often excluded from decisions that affect them — this is one of the most important achievements of this tribunal. Not all the witnesses could testify in Spanish (a second language for many indigenous community members, especially older people). One elderly woman spoke through an interpreter in Mam (the local Mayan language), detailing the violence and threats she and her family had been subjected to because of her refusal to sell her land to the mining company. Our framework for understanding all these detailed testimonies included a wide range of international covenants, charters and agreements (from 1948 through 2007) focusing on public health as a fundamental human right while emphasizing a holistic understanding of health as what is needed for a complete state of physical, mental and social well-being. This vision is particularly crucial in the light of indigenous and peasant peoples’ worldviews based on a sacred relationship and an unbreakable bond between communities and their ancestral lands. Our ruling reflects what can only been seen as a pattern in Goldcorp’s systematic behaviour as well as the company’s deliberate refusal to protect the rights of people. The facts we heard indicate that the company has not shown any real concern for the quality of life in affected communities, where health impacts are among the most visible social impacts of this extractive mining model. The public image which Goldcorp carefully cultivates as a “socially responsible company” does not fit with the facts this tribunal heard. We found the testimonies by the affected community members to be trustworthy and accurate accounts of reality. Our panel of judges found Goldcorp guilty of seriously damaging to the health and the quality of life, the quality of environment, and the right to self-determination of the affected indigenous and peasant communities in Mexico, Guatemala and Honduras. We also found national, regional and local governments in those countries guilty of being complicit and irresponsible for not protecting the rights of those affected by mining. Importantly, we found the Canadian government guilty of supporting and promoting in various ways irresponsible mining investments in Mexico, Central and South America, among other regions of the world. Our panel of judges went on to recommend to local groups that they use all peaceful means at their disposal to stop the operations of Goldcorp in their territories. We also called on governments at all levels to ensure compliance with existing national legislation and international agreement, in particular those that guarantee the right to free, prior and informed consent, and respect for and enjoyment of the rights of indigenous peoples, their traditions, cultures and decision-making processes. In the case of Goldcorp, we concluded that the corporation owes reparations for damage to the health of the population, the damages to the environment, and to the affected indigenous and peasant communities, in the form of compensation for past, present and future damages to the communities, taking in consideration that environmental contamination is ongoing and can continue still for hundreds of years. Finally, we urge the suspension of all Goldcorp mining operations in Mesoamerica and a commitment not repeat the destructive practices that we heard described. On Sunday, July 15, our final verdict was presented in Spanish and interpreted into Mam before hundreds of mostly indigenous community members. In this country, there is still much grassroots work to be done to make Canadians and civil society organizations aware of the impacts of mining companies on community health the world over. We must demand a regulatory framework that protects vulnerable communities by requiring free, informed and prior consent from communities before there is any mining. Anything short of that will mean more mining-induced health emergencies in vulnerable communities. David Heap is a member of the Latin American Canadian Solidarity Association in London, and teaches at the University of Western Ontario. Judy Deutsch is a social worker and faculty at the Toronto Institute of Psychoanalysis, as well President of Science for Peace from 2008-2012. The Peoples’ International Health Tribunal came to a close today shortly after the reading of the judge’s final deliberation. The panel summarized the facts of the case against Goldcorp that they had heard in the previous day of testimonies regarding health issues, heightened birth defects, the contamination of the environment and lack of consent, as well as the psychological impacts of community division and the criminalization of dissent and the collective health of the community regarding issues such as addiction, an increase in sexually transmitted diseases and gender violence. The distinguished panel delivered a guilty verdict to Goldcorp, the host countries of Honduras, Guatemala, and Mexico, as well as the Canadian Government for supporting and promoting in various ways the irresponsible mining investments in Mesoamerica. For the reasons above described, we find Goldcorp guilty for its activities in Honduras, Guatemala and Mexico, which we find to be seriously damaging to the health and the quality of life, the quality of environment, and the right to self determination of the affected Indigenous and campesino communities. Following the verdict, the judges read recommendations to the communities and demands of Goldcorp and of the States (national, departmental, state and municipal governments). Read a full (rough) transcript of the Tribunal here. For interviews, please get in touch with our media contacts. 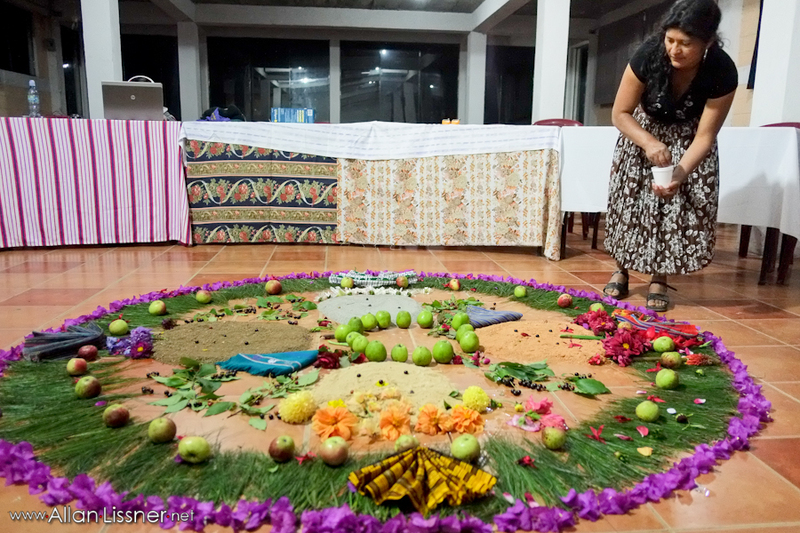 The night before the tribunal, women prepare the space for testimonies. 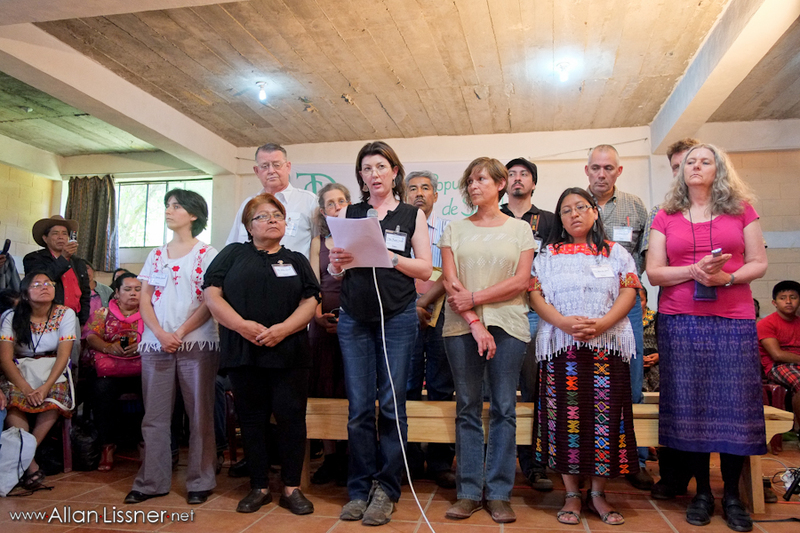 The Peoples’ International Health Tribunal began today with an opening prayer in the highlands of Guatemala where Goldcorp operates their Marlin Mine. The tribunal will feature community testimonies from Goldcorp-affected communities in Mexico, Honduras and Guatemala as well as testimonies from experts in community health, psychology, international law, and environmental health. In lead up to the Peoples’ International Health Tribunal on Goldcorp, we made a series of videos based on the work of mimundo.org photojournalist, James Rodriguez. These videos profile some of the local struggles in San Migual Ixtahuacán that we will be hearing about first hand during the community testimonials. Only 6 days left before the health tribunal. Check out our new Peoples International Health Tribunal. Would you like to cover the Peoples International Health Tribunal? Would you like to interview someone on health issues, Goldcorp and/or the health tribunal? Check out our list of contacts here. Did you miss the live-stream TV interview on holistic health and health impacts of the Marlin Mine in San Miguel Ixtahuacán? Check out the recorded version here: http://www.ustream.tv/recorded/23745214.